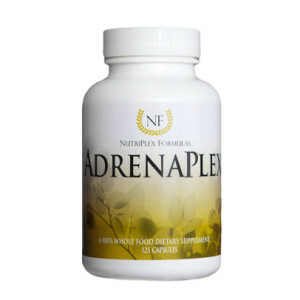 If adrenal glands — the body’s energy-backup system — are exhausted and under-producing, AdrenaPlex offers added support to help them function more robustly and more efficiently. Excellent for energy, continued health & more! Inactive Ingredients: Gelatin Capsule (gelatin and water), Microcrystalline Cellulose and Silica. In addition to the unique properties, synergists and cofactors of this food, each serving provides the following nutrients contained within the above food-nutrient blend (not as isolates): Amino Acids, Vitamin C, Vitamin B, Minerals and Enzymes. 2 capsules daily, or as directed by a healthcare practitioner. The function of the adrenal glands may be severely affected by sustained, long-term stress, which may lead to abnormal blood-sugar regulation, muscle-protein breakdown and suppression of the immune system.